PHOTO: Graham Jepson / "Scotland on Sunday"
Kevin McKidd is a well known Scottish actor. He was born and spent his childhood in Elgin, Moray, Scotland. He is best known for his portrayal of Tommy in the film "Trainspotting" and his work on the critically acclaimed television show Rome." As a teenager, he was part of a rock band called Plan 9. The group achieved a moderate amount of success and toured all over Scotland. He got into acting at a young age, joining the local Moray Youth Theatre group as a teenager. He shifted gears, however, and enrolled at the University of Edinburgh with a focus on engineering. He soon dropped out though and switched to the Queen Margaret College to study drama. Kevin fully immersed himself in his studies, even joining the University's student theatre company, Bedlam Theatre. Kevin landed his first television role in 1996, playing Father Deegan in the British sitcom "Father Ted." This led to his seminal role in the international hit "Trainspotting" and several small parts on British serials and miniseries. In 2002, he caught the eye of acclaimed director Ridley Scott. Ridley cast him against Orlando Bloom and Liam Neeson in his war epic "Kingdom of Heaven." This led to further work in films such as "Nicholas Nickleby" and the "Silence of the Lambs" prequel "Hannibal Rising." 2005 found him cast as Lucius Vorenus in the HBO series "Rome." The show received tremendous acclaim and was on the air for two full seasons. Recently, he was cast as the lead in the NBC science fiction series "Journeyman." The show premiered in the 2007 fall season. 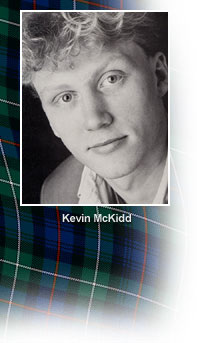 Born and brought up in Elgin, Kevin wanted to be an actor ever since he took part in school plays at "around six or seven." He dropped out of Edinburgh University, where he was studying engineering, to take up a drama course at Queen Margaret's College, and from there was picked up by leading theatrical agency ICM. Mr McKidd is patron of Elgin-based drama group Out of the Darkness Theatre Company, where his mother Kath is an administrator. Kevin McKidd has come a long way since he lay in his bed in a council estate on the outskirts of Elgin in north Scotland, dreaming of Steven Spielberg discovering him. "I always thought I wanted to be Eliot," he explains. "I wanted to have an alien as a mate. I wanted to be in a Spielberg movie and hang out with E.T. because he was the coolest thing I'd ever seen." The son of a plumber and a secretary in a lemonade factory, who is now the administrator of a disabled children's theatre company in Elgin, McKidd, the youngest of two brothers, had an impoverished working-class upbringing. With no artistic influence, he fell into acting as a result of athletic inadequacy. "I couldn't play football because I was really fat," he explains patiently. "I was a big beefer. When I was 14, I shot up and lost it, but before that I was very short and dumpy." He pauses and winces slightly. "Ask my mum if you don't believe me. The first time I went on stage was during a school play and everyone laughed, either because I was fat, or because I was being funny. I wasn't sure. Anyway, it was a good buzz and I just knew that's what I wanted to do." His parents were less than keen. They wanted him to do something grown up that had a future. So Kevin, by way of appeasement, did engineering for part of one term at Edinburgh's Queen Margaret College in 1992 and then switched to the drama course. "As soon as it started to work they were very supportive," he remembers. "they are really cool people," he adds. "They said: 'Look, we married young, had kids young, we never had the chance to know what we could have done, so make sure that you give it a stab.'" Meanwhile, he and wife Jane have moved out of London to the Bedfordshire countryside, to provide a bit of space for their two children, Joseph, two and two-month-old Iona. Kevin McKidd, who has starred in films including Trainspotting and Dog Soldiers, has recently completed filming in Tomintoul for his new movie The Bum's Rush.